Labor Day has come and gone, so it’s back to the books for students young and old. To show our school spirit we’ve created this short and sweet pop quiz (we’re such easy teachers; we’ll give you an A just for trying). The subject is history, or to be more specific the history of a few of your favorite modern desserts. Here’s part two of our three-part quiz. No need to cheat as we’ve provided the answer at the end of this post. Question #2: Who made cake pops popular? On her blog, Bakerella tells the now legendary tale of how she invented cake pops in January 2008. One weekend she decided to try baking red-velvet cake balls. 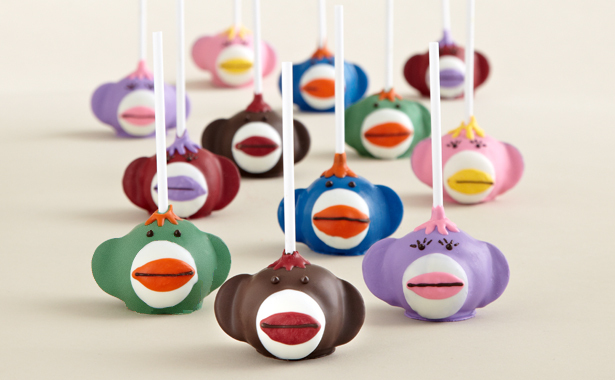 On a whim, in an attempt to make them even cuter, she stuck them on lollipop sticks, and presto, cake pops were born! But Bakerella didn’t stop there. She decided to try and actually make the balls into little shapes. She re-formed the cake balls using cookie cutters and then dipped them in multi-colored melted chocolate. The response to her creation was heard all over the Internet and about a month after she posted photos of her adorable cupcake pops, Martha Stewart invited her on to her show to teach the world how to make them. The rest is cake pop history! Bakerella, known to her friends and family as Angie Dudley, has also gone on to publish books about her famous pops and even has a popular “cake pop maker” toy licensed in her name. Do you remember your first cake pop? Have you ever tried to make them on your own?